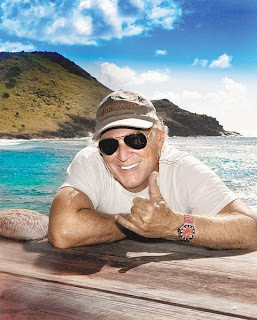 Jimmy Buffet isn't just a concert. He is an experience. The evening started at Buffet's restaurant chain, Cheeseburger in Paradise, with the pressed burger with Velveeta and salsa ketchup. It was quite possibly one of the best burgers I have ever consumed. My first bartender was a bit of a grumpapotomous, waiting to leave. The second guy was amazing. He was all about the flair tricks and tossing full beers across the bar. My friend was shocked and amazed at the scene of the concert. This was her first Buffet, so it was all new for her. All the people twice our age in hula skirts and coconut bras, in stretch limos or drinking out of the back of an Escalade. Jimmy seemed to be a little over it all. Honestly, the shows have become bigger than he is. You could have some older guy up there lip syncing to a Buffet album and everyone would still have a blast. The crowd is friendly if not intoxicated. It is as if everyone is remembering that one spring break, or other great trip away from home. So, even though it rained it was a great night. And a great cheeseburger.